A conference swag item was this coaster with embedded flower seeds. Quite a nice metaphor, no? Though I’ve been a volunteer for the Archives Association of Ontario since late 2015, I finally had the chance to attend my first AAO conference last month at the Faculty of Information at the University of Toronto. I’d long heard that the AAO conference is one that is firmly devoted to archival practice, and this edition (the 14th since 2004!) only supported this notion. Most of the presentations I attended reflected on active projects or initiatives rather than working through the more arcane considerations of archival theory. For my part, I presented on Permafrost, a hosted digital preservation service I have been piloting with Lakehead University Library. Sara Janes, the University Archivist, was kind enough to attend and co-present on her experience with the pilot so far. The conference’s emphasis on field work over behind-the-desk theory has the advantage of making it more accessible, particularly to those not formally trained in the profession, but the downside is that it’s sometimes hard to link projects and initiatives back to the bigger concepts that inform them. Nevertheless, I think that there was an underlying ethos and set of ideas that connected many of the presentations, which I’m taking the chance to delve into a bit deeper in this space. The conference theme was “Come Together: Meaningful Collaboration in a Connected World.” In my editorial for the Spring 2017 issue of Off the Record, I wrote that conferences such as this are a method of grounding the abstract idea of community in the real-life friendships and relationships that sustain that community. Though conferences are a fine way of exchanging information, their real value is the opportunity to meet and talk face to face. Seeing old friends and making new connections helps us invigorate our work and our sense of place and value in the archival community. Or they may just give us an occasion to compare problems, vent frustrations, gossip, and drink too much coffee. All have value. However, this idea presupposes that the community includes all those who should have a seat at the table (not to mention the ability to pay for the conference itself). What about individuals who are not yet part of the community and might not even know it exists? Or those that might be aware or interested, but do not feel enabled or are not funded to take part? Inquiries in this area formed a significant thread of the conference, I think. It was reflected in the title, of course; collaboration that is “meaningful” as opposed to obligatory or programmatic. “Collaborate” is often a buzzword deployed to make it seem like an organization is caring or connecting, but there may be no accountability for its realized impact. How can the archival community ensure collaborative efforts have actual positive effects? One key subject addressed by the conference was reconciliation with Indigenous peoples and knowledges in Canada, both as an archival community and within archival theory and practice. A second was the profession’s support for students. And there were several other presentations I had the chance to attend that also touched on similar themes of community-broadening. They keynote was delivered by Michael Etherington, Cultural Program Manager at the Native Canadian Centre of Toronto and a noted speaker. His talk was remarkably wide-ranging, touching on everything from international law and Indigeous governance to his personal experiences growing up in James Bay. His speaking method invited the audience into his own personal community: it was so engaging, intimate and conversational, it hardly felt like he was addressing a large room full of archivists. He challenged the audience to mature their relationships with Indigenous individuals and groups in their regions, including acquainting themselves with the treaties that cover the territory they live on, and to move beyond rote territorial acknowledgements and token Indigenous presence at events to more substantive involvement. He also addressed some of the awkwardness that comes with settler perceptions of Indigenous people, particularly despite good intentions. Obsessively struggling with terminology is one example. Rather than anxiously Googling “First Nations vs. Aboriginal vs. Indigenous?? ?,” figuring out what the preference of the communities and/or individuals you wish to meet with is a good start. Or asking a living person wouldn’t hurt. Similarly, he mentioned how some overly cautious settlers worry that there’s some special protocol to speaking with an Indigenous person, when it’s only a shake of the hand, a friendly hello, and a willingness to listen and learn that’s necessary. One of his closing comments related to the treaty covering his home community, James Bay Treaty no. 9. He related the emotional experience he had when seeing this treaty in person for the first time. For the archivists he interacted with, he noted, it seemed like any other piece of paper, but to him and many members of his community, it is a fundamental document tracing their history and their rights. We hear about how important documents such as this are in the abstract all the time, but for me, hearing about this crucial kind of relationship between a document and the people whose rights it impacts was very affecting. Just after the keynote, Sean Smith of the Archives of Ontario and Iona McCraith and Lisa Snider of the Archives Association of Ontario gave presentations on their own Indigenous-related outreach. Both have made efforts in this domain over the last year, with the AO working towards its Indigenous Relations Working Group and the AAO pulling together resources regarding reconciliation. Both noted, however, that substantive work is yet to come. For the AAO, one of the key issues is actually connecting with Indigenous community recordkeepers who could benefit from the services that the AAO provides and improving Archeion’s description of Indigenous-related materials. 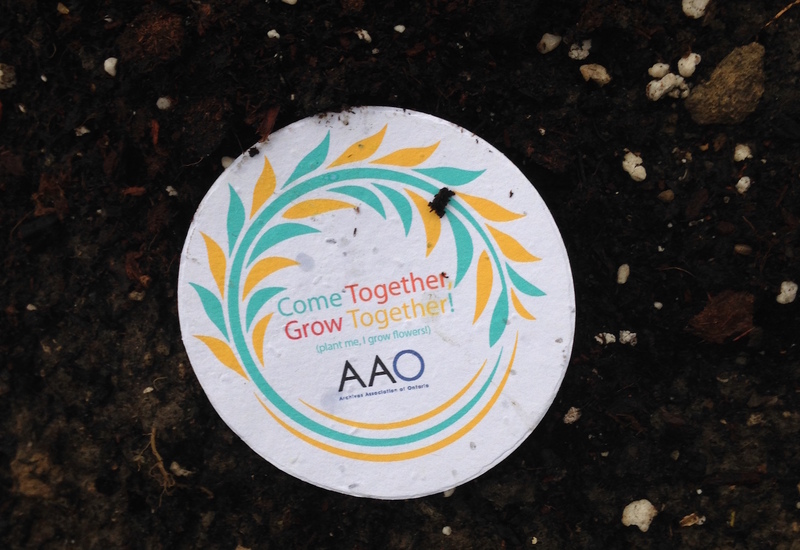 For the AO, it means connecting more clearly with the communities that have an interest in records, seeking advice and feedback, and improving inclusivity. I spoke with Sean after his presentation on a question that’s been bothering me in this area: how much labour on behalf of an institution’s “engagement” strategy should be borne by the community the institution wants to engage with? It hardly seems appropriate to ask members of an Indigenous community, for example, to work with an institution without providing adequate resources to that community. Community members are busy enough supporting their own needs; an institution that says, “here come engage with us” has to provide resources to enable participants to do so. 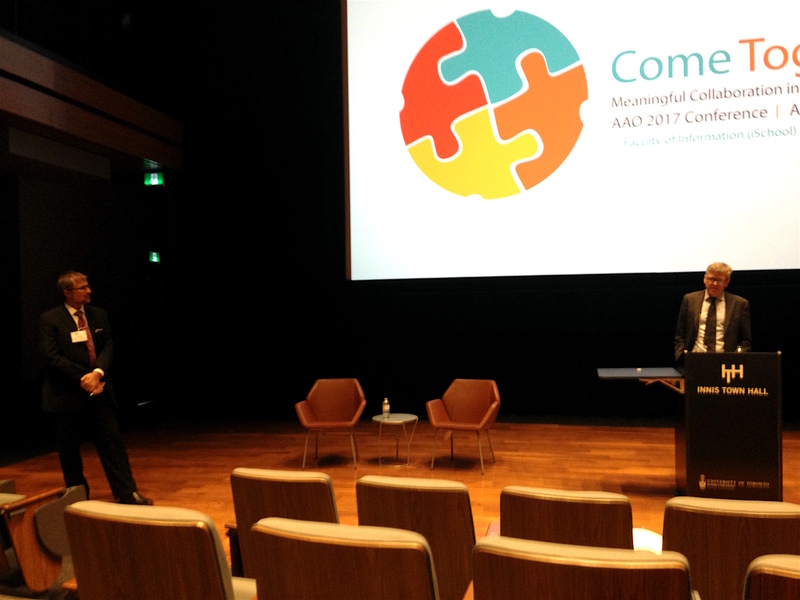 Raymond Frogner (right) delivering his plenary talk, moderated by John Roberts (left). Finally, Raymond Frogner, Director of Archives at the National Centre for Truth and Reconciliation, gave an incredible plenary talk titled “Red Jenkinson: The Indigenous Influence on Modern Archival Practice.” His talk traced the role that George Hunt, a Tlingit consultant to the anthropologist Franz Boas and accomplish linguist and ethnologist himself, played in influencing postmodern archival theory. It was a fascinating talk, and one whose subtleties can’t be really borne out here with my scratchy notes from it, but I hope he intends to publish it. It also speaks to a larger question of making archival theory more hospitable to Indigenous knowledge practices, which may actually confirm or provide stronger support for existing strands of archival theory, just as it may also challenge its colonial origins, assumptions and myopia. The position of students interested in joining the profession was a second thread that relates to the theme of making our community more hospitable. Of course, all professionals were students of some kind at one time or another. 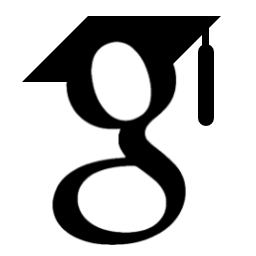 However, the transition from student life to professional life is not always smooth, as students navigate contract work, sometimes for years, and may need to develop skills that aren’t covered by existing programs of study. (A common complaint I hear about is a lack of digital-oriented skills). The AAO has been working over the past year and a bit on improving student outreach, and I’ve had the pleasure of being part of this initiative. One of our accomplishments was pushing the student membership category into two years post-graduation to help mitigate loss of members due to financial precarity. It was fantastic to see a number of student sessions at the conference. One I was able to attend featured a panel of students from the ACA U of T student chapter and the Association of Moving Images Archivists Toronto and Ryerson student chapters. The panel reviewed the ways in which student associations have been working together to share resources and improve training among themselves. Their challenges and concerns echoed a lot of the same ones we experience on the AAO board, such as how to model collaborative governance, how to find sources of stable funding, and how to attract (already overworked and busy) members. It was impressive to hear them describe juggling these issues and working through them as a group. It was also interesting to hear that student groups are finding that to attract members, they’re prioritizing professional development opportunities through workshops over social events like pub nights, which used to be the norm for these kinds of groups. It points to a potentially worrying trend where underfunded or unfunded student groups are trying to fill in gaps that professional programs should be covering. There’s also an opportunity for the AAO to fill in this gap - though this is not what the Association is really designed to do at this point. However, it is important that we continue to figure out ways in which the transition from student to professional can be supported. Without burdening the post too much further, there were some other excellent presentations that tied into similar themes. Karen Milligan and Tracey Krause of the Hamilton Public Library presented on a new oral history initiative that is intended to broaden its reach beyond traditional participants. Danielle Robichaud and Krista McCracken gave a great talk on using Wikipedia for archival activism by writing pieces on underrepresented people or communities and by promoting archival collections - both ways in which archives can see their mark made beyond the institution and hopefully make an impact in non-traditional ways. Many thanks to the AAO conference organizers (who were primarily made up of members of the Toronto Area Archives Group chapter) for putting on a fantastic event, and to the conference presenters for thoughtfully engaging with the theme. There were so many examples of grounding collaboration in thoughtful action - exactly what the AAO conference should be doing!